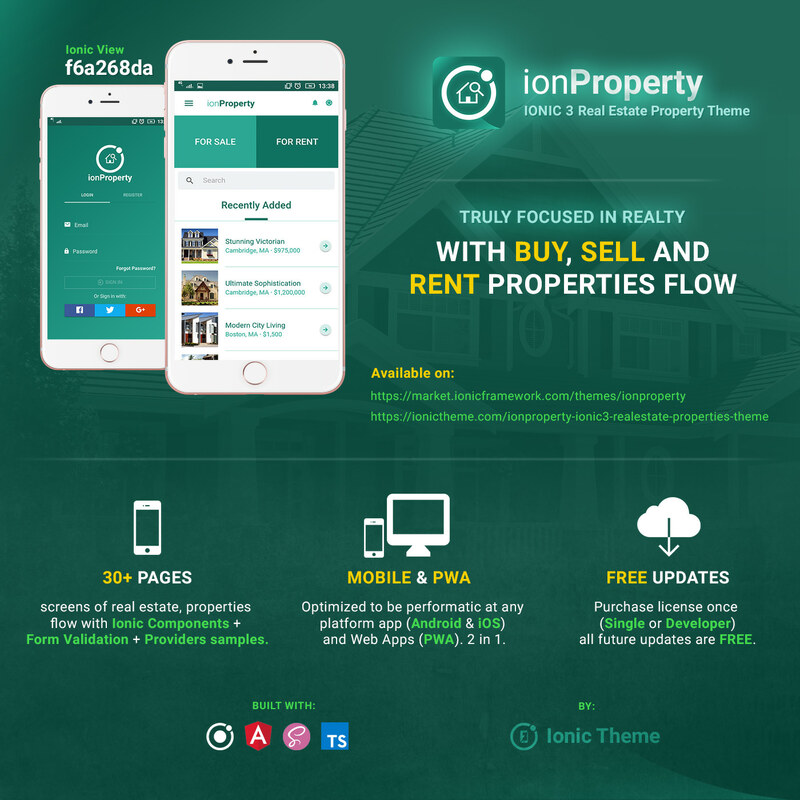 Ionic 3 Real Estate Properties theme truly focused in Realty Buy, Sell and Rent properties. Nice, useful, simple and beautiful! Congratulations!! Good sells. cool design. 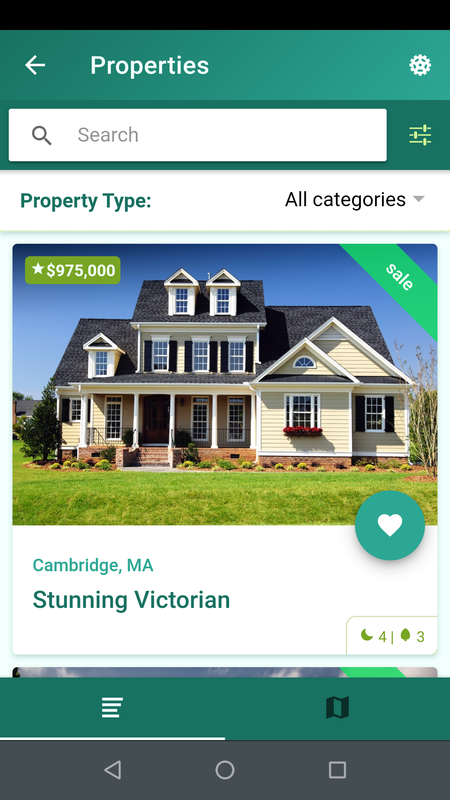 If I buy ionproperty, can I get native codes layout and PSD ? Hi, thanks for pleased with my theme. All codes included, but the PSD's is only Icon and Splash screen available in this pack. Hi, yes it can! But soon i'll release the pro version with more codes and PSD's over the pro license. Hello, if I make the purchase, do I have access to the next updates? Hi, sure you i'll have access a lifetime updates from any theme that you buy from us. 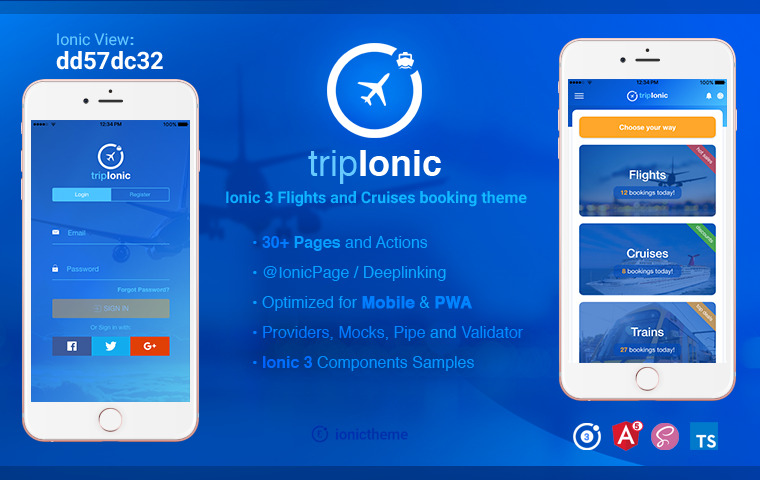 You can follow the updates here and our official website: https://ionictheme.com Many thanks. Hi thank you for you preference of my theme. property-service-rest is only an Angular Http example, suitable for single Apis without authentications, contact me in [email protected] I'll send for you some examples. 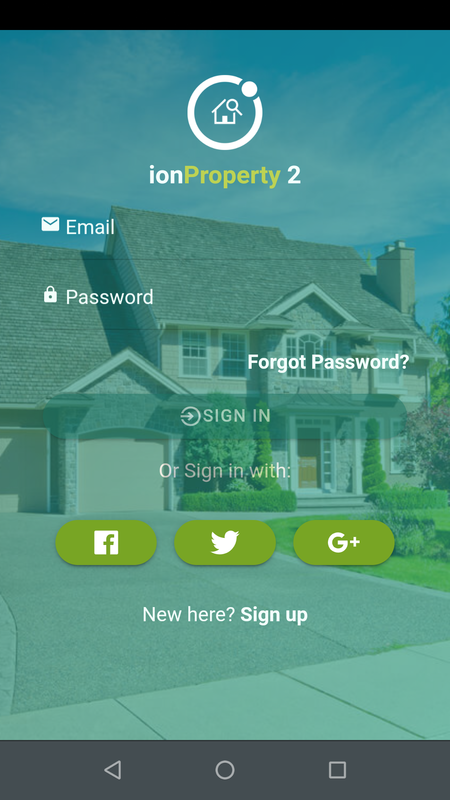 ionProperty 1.2 - Completely Refactored! 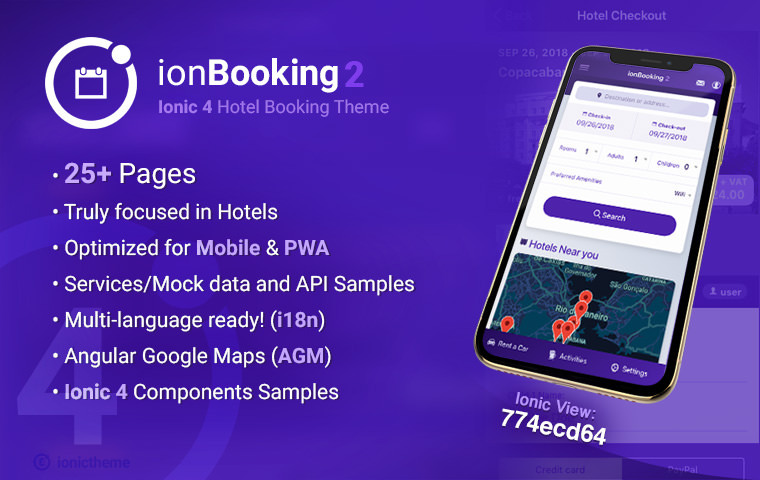 Now it has IonicPage / Deeplinking, PWA version integrated (2 in 1) with custom scripts to build for web. 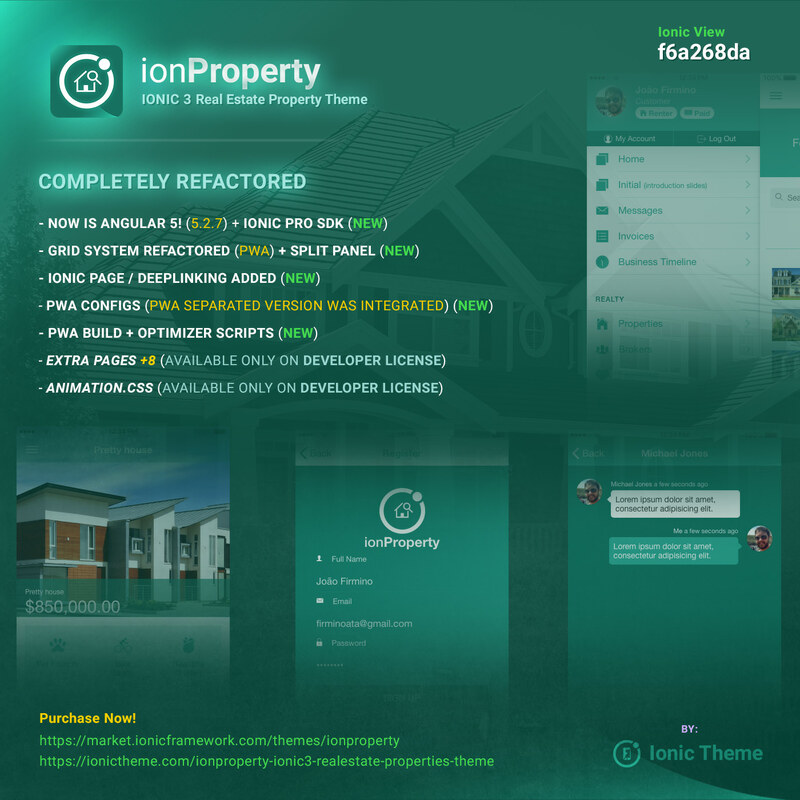 Better than ever and totally revamped, now ionProperty is a more complete and performatic theme. 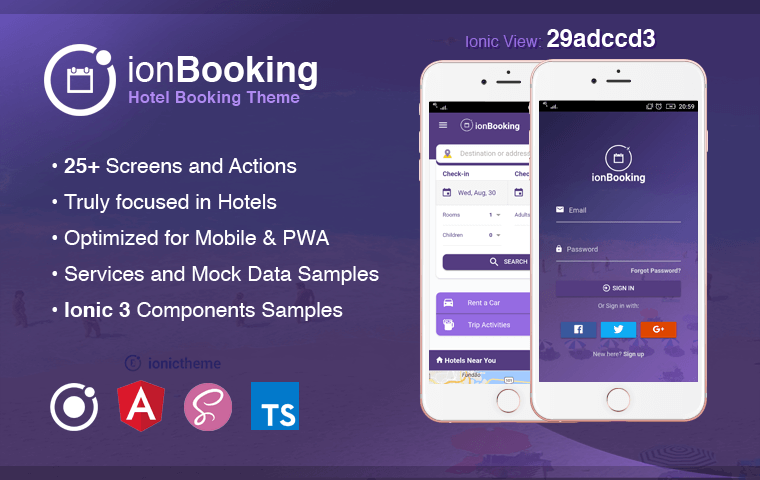 Hi, I can't view it in Ionic View app ( Android) with view id f6a268da. Nvm, I tried others view IDs, none of them works. I think it's my own problem. Apple took down the app from App Store.. I bought it anyways though. Thanks for the great app! 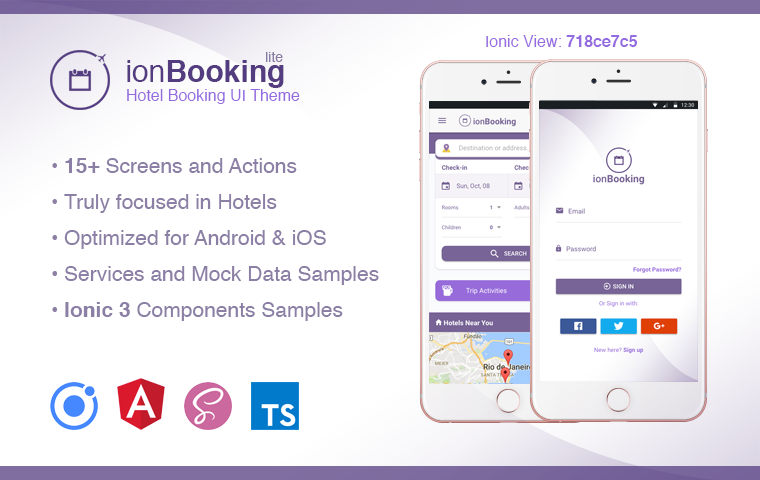 But the video background of Login 5 page doesn't work when I view it in Ionic DevApp. It plays the video in fullscreen automatically. How can I fix it? Thanks! Just to clarify.. 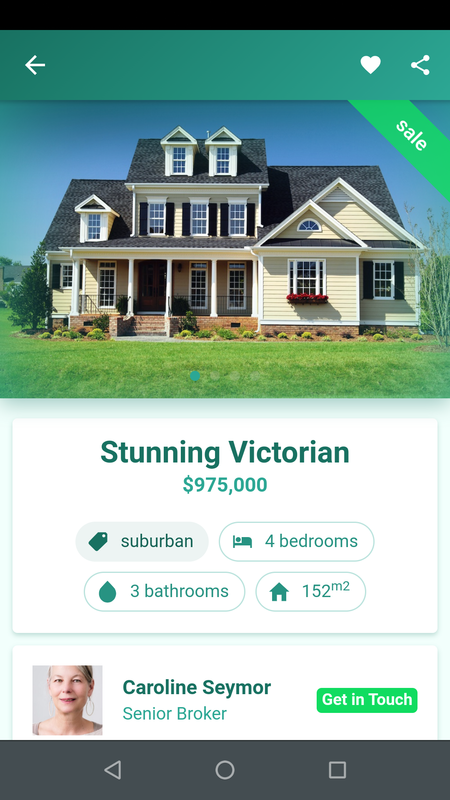 I used my old android phone for viewing the demo 2 days ago (Because the view app unavaliable in App Store). Now I'm using Iphone for developments. 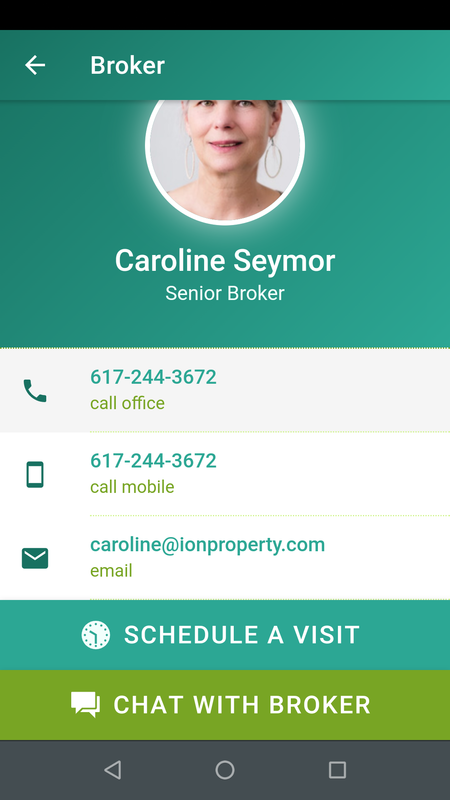 So the video background doesn't work in Iphone's Ionic DevApp. I haven't tested it in Android. Sorry for the confusion. Hi Frank, many thanks for your preference. send me an email to: [email protected] and send me if possible a screenshot of this screen error, maybe i know what possible is happening. 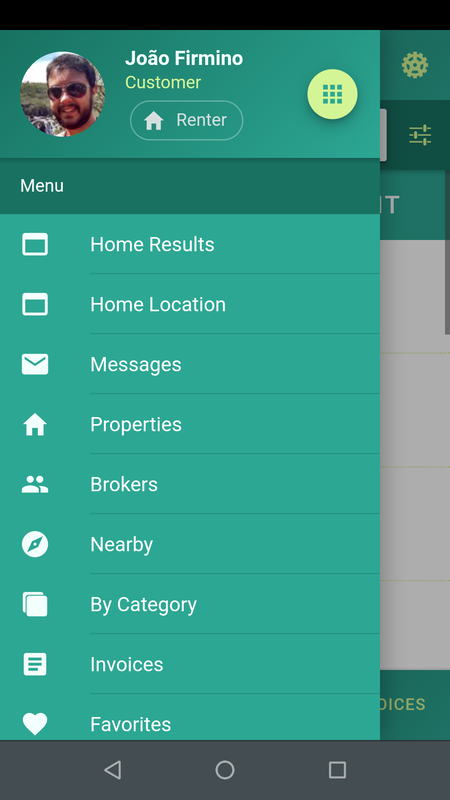 Testing on Android, everything is well. Many Thanks. For those who read this post, the developer tested on iOS 10, 10.2 and 11 and everything is going well. 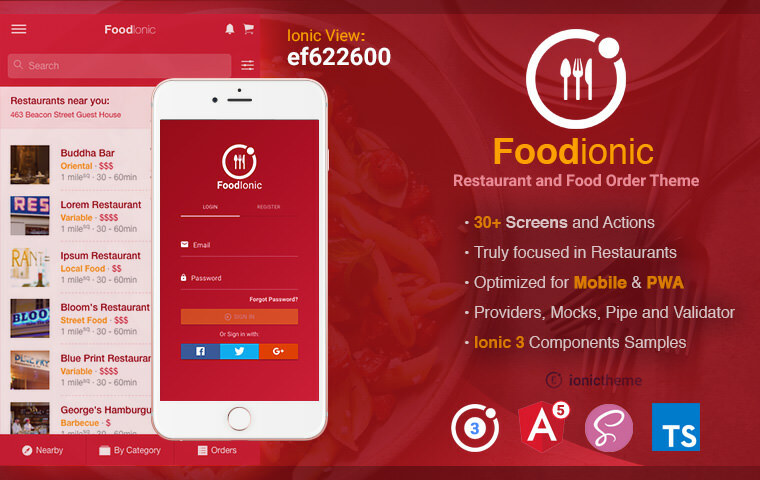 This video background problem is occurring only on Ionic DevApp. Is there way to connect it to Wordpress existing website? 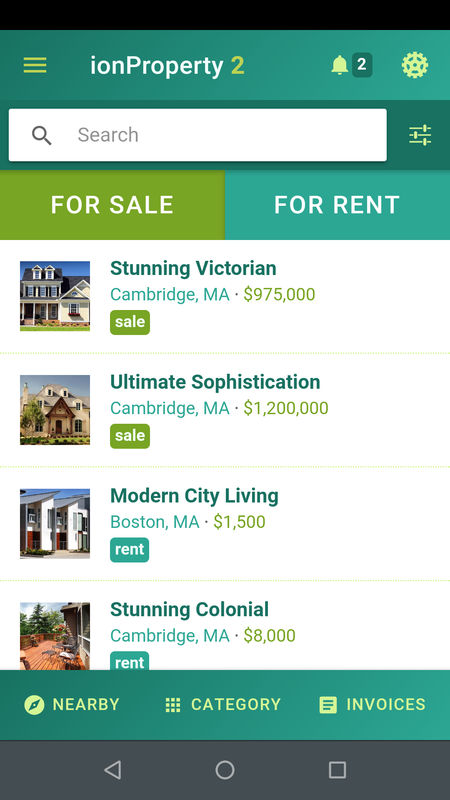 To pull properties automatically? hi, this theme have the logins with the socials apps integrated? or i have to implement by my self? and the push notifications, and security of the login users as well? Hi, the main difference is the license by yourself! 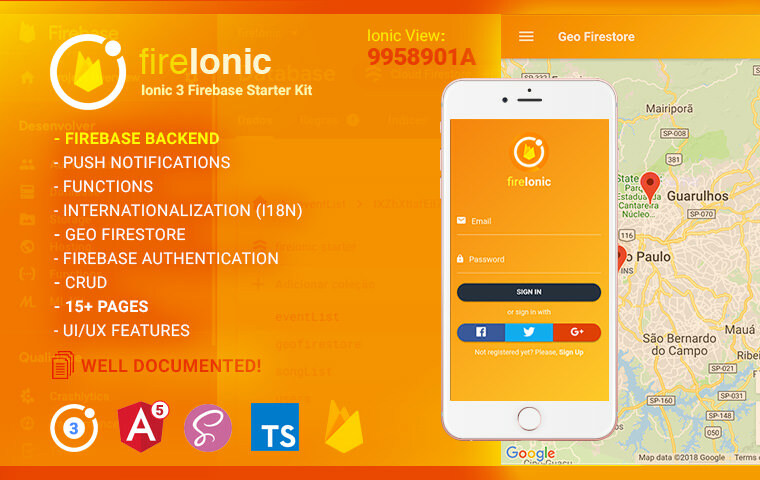 check it to know more about: https://ionictheme.com/license/ And the developer license comes with 8 extra pages (as a plus): - Register extra page, - 5 login pages (one of them with video background), - 1 animated list menu, - 1 extra Property listing page Many thanks for your interest. Hi ! I can not make the payment. I have an error that the system could not verify the information on my card. The information on my card is correct. Is there a problem ? I want to buy the developer version but the price is $38. But in description is "from $19 to $15.20 in December, valid for both licenses, Enjoy!!"